No President has more all time closing highs in their first year in office than President Trump. The rise in the DOW since Donald Trump was elected President in November 2016 is historic! Yesterday was another all time closing high for the 5th day in a row. Americans are seeing this in their retirement accounts! * President Trump is already the only President in US history to oversee two stock market rallies of nine days or more where the markets set new highs each and every day. * The DOW daily closing stock market average has risen 22% since the election on November 8th. (On November 9th the DOW closed at 18,332 – on September 18th the DOW closed at 22,331 – another all time closing high). * The DOW is now up by 4,000 points (3,999) since the election. So how does this compare with President Obama’s first few months? 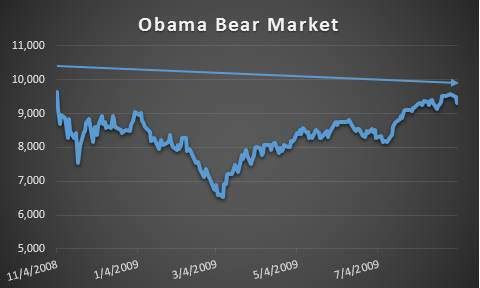 The stock markets under President Obama moved in nearly the exact opposite direction in the nine months after President Obama’s election win in November 2008. * The DOW daily closing stock market average tanked (went down) (-31%) between Obama’s election win on November 4th, 2008 and March 5th, 2009. (On November 4th the DOW closed at 9,625 – on March 5th the DOW closed at 6,594. Overall it decreased more than 3,000 points during this time). By September 18th 2009 the DOW was back to above 9,000 at 9,820 and barely above the November 4th 2008 stock market closing average. During this time period the stock market never reached a new stock market high. As a matter of fact, the Obama stock markets didn’t reach a new all time high during Obama’s entire first term (4 years).